There is something rather fun about food in a jar. Not only is reusing a jar greener (and easier to wash up) than using plastic, they look so pretty too. No wonder there are several Pinterest boards devoted to food in jars! I am becoming increasingly anti plastic and thus a fan of storing food in jars in the fridge, and have a collection of these straight sided French jam jars with their pretty gingham lids. The straight sides mean they are easy to scrape out, the jars are easily washed or go in the dishwasher, and the lids reduce my use of clingfilm. 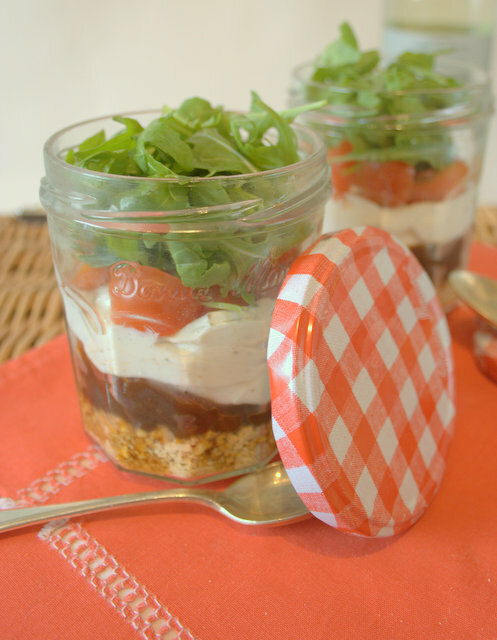 These layered picnic pots are inspired by a sweet cheesecake served in a jar – in my savoury version the base is made from crushed crackers, topped with onion marmalade then a cheesy creamy layer. You will need to start this off the day before you want to eat these, but actual hands on time is very little. Once made the labneh will happily sit in the fridge for several days. 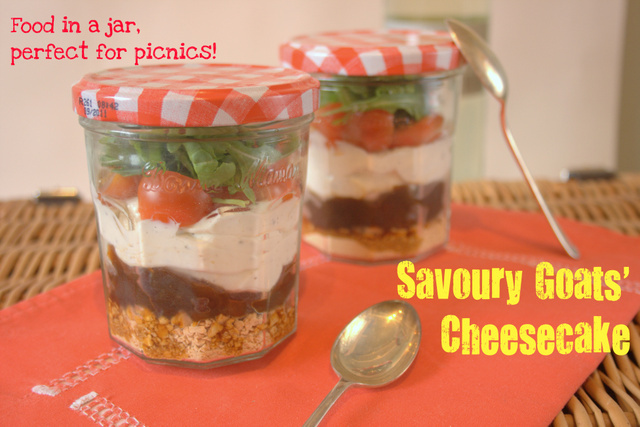 If you try this Recipe: Goats’ Cheesecake Jars – Perfect for Picnics please tag #FussFreeFlavours on Instagram or Twitter. It is amazing for me when for me when you make one of my recipes and I really do love to see them. You can also share it on my Facebook page. Please pin this recipe to Pinterest too! Thanks for reading Fuss Free Flavours! 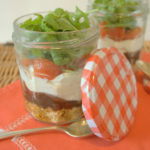 A cheesecake with a twist - savoury and served in a jar! These Goats' Cheesecake Jars are easy to make and perfect for a picnic! Line a sieve with a cheese cloth (or a new J-Cloth), stand over a bowl, pour the yogurt in and allow to strain for 12 hours. Rather than pouring down the sink use the leftover whey in bread or dal (it should freeze well) or use it to water your herbs as it is full of nutrients. Scrape the labneh into a bowl, add the cream (or milk), finely chopped Goats cheese and spices and mash well with a fork. Crush your biscuits - either in a spice grinder or place in a plastic bag and bash with a rolling pin. Pour into the bottom of each jar. Layer the onion marmalade on top, followed by the goats' cheese labneh* (I used a piping bag with mine). Top with salad leaves and quartered cherry tomatoes. Put the lid on and take on a picnic! * You will probably need about two thirds of the labneh, the rest can be used as a dip or pasta sauce.